For this entry, I do not have a photo, only a description of my great great great great grandfather, whom I suspect had a huge influence over subsequent generations. The love of music is a clear trait that I inherited from my father, grandmother and I believe goes back to Francis George and beyond. On the marriage certificate of his son George to Lydia Bird in 1851, he is referred to as ‘George Sternberg, Professor of Music’ and I assume that ‘George’ was the name he used throughout his life. Francis George was from a family of musicians from Lüneburg in north Germany. See Stan Bruce’s account of the German Sternbergs for more information. Ironically, I stayed in Lüneburg when I was eighteen, cycling across Holland , Germany and Denmark with a school friend whose grandmother lived there. At that point in my life, I knew nothing of my Lüneburg ancestors, but I fell in love with the ancient town. Francis George Sternberg was born in Lüneburg on 29 August 1761 and baptised in St. John’s Church, Lüneburg with his original German names, Frantz Georg Sternberg on 1 September 1761. His godfather at baptism was Frantz Georg Brown. More coincidence here, since his great grandaughter married Henry Brown. 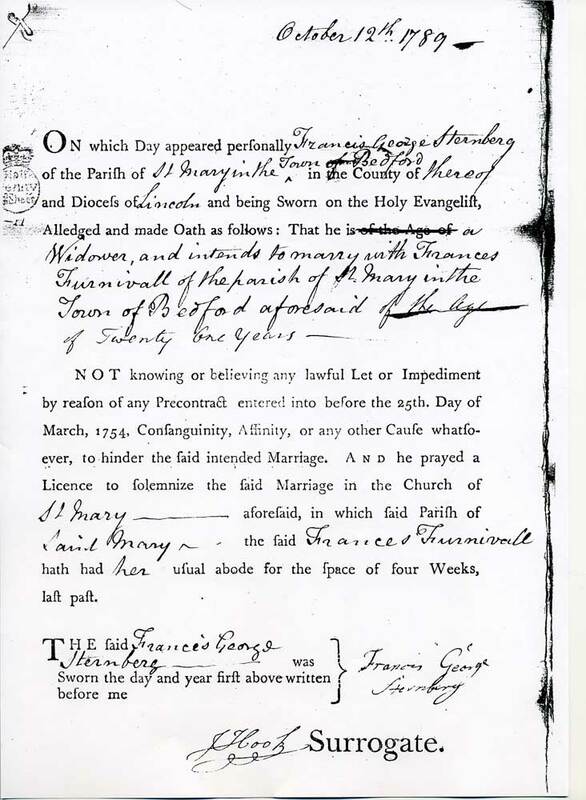 His mother died when Francis George was only seven, in May 1769. He became a trumpeter in the Royal Horse Guards Regiment in 1786. George III who was King of Britain at this time was also elector of Hanover and it was not uncommon for soldiers from North Germany to enlist in British regiments. Age at enlistment 22 (this does not quite tie in with birth date – he should be 24 or 25 ! ), Height 5’5″, born Luneburg, Germany. Hair, eyes and complexion brown; Musician by trade; date of service: 5 March 1786, Troop H.
End of service: trumpeter, 30th May 1797, own request; character good. In many of the above musters his name is recorded as ‘Stanburg’ or ‘Stanberg’ . Also present at several of these musters was Nicholas Doring, trumpet Major, enlisted 25 May 1777. Could this be where his son Francis Doering Sternberg got his name from? There is another fascinating cause for speculation in that last posting. His future namesake grandson, Francis George Sternberg born in Northampton in 1829, married Lizzie Plucknett. Her grandfather, Thomas Plucknett was a drummer with the Royal Marines. Did the two men meet in Weymouth and form a family friendship that was to survive to their grandchildren ? Weymouth was a favourite resort of George III and I am sure that his Hanoverian soldiers, including FGS, were made to feel at home there. 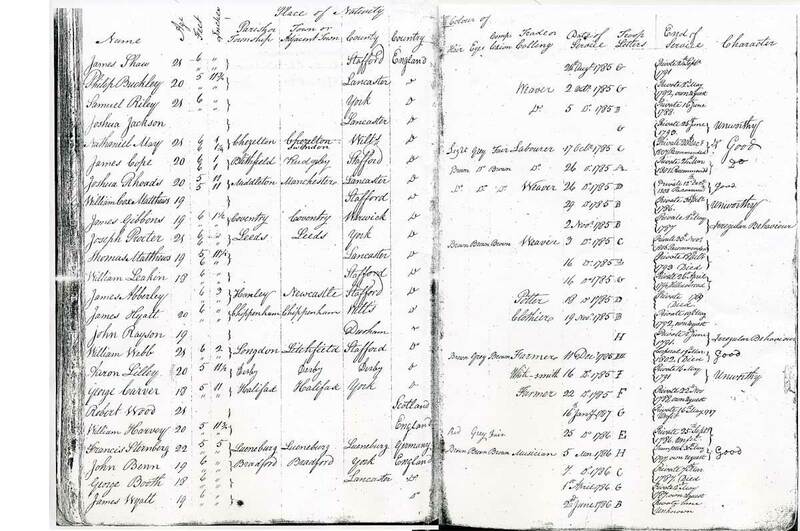 Notice also that on Christmas day 1788, the young FGS was posted to Bedford. It is very likely that shortly aferwards he met twenty year old Frances Robina Furnivall who was born in that town in 1768. In the 1861 census Elizabeth Sternberg widow, mantle maker, living in Barnstaple with daughter Amelia E.R. (24) Elizabeth’s birthplace given as Yorkshire. Amelia is a milliner, born Bolton, Lancashire (1837). Sadly, ten years later, Elizabeth is recorded in the 1871 census as a patient in Devon County Lunatic Asylum at Exminster. Amelia Sternberg married Stephen Henry Wadham about 1868 and was living Barnstaple at the time of the 1881 census. Francis George and Frances had a son Thomas Furnivall Sternberg (notice use of mother’s maiden name – common practice at this time) however he almost certainly died in infancy since another Thomas was baptised in 1794. This Thomas is the likely author of ‘The dialect and Folk Lore of Northamptonshire’ published in 1851. In turn his son, Vincent Thomas Sternberg was librarian of Leeds ‘Old Library’ from 1857-1880 and is said to have haunted the library after his death. I have a copy of Thomas’s book. Eight years after his marriage, Francis George sought discharge from the army and settled with his family in Northampton. In all they had nine children and were a well known family in Northampton by the start of the nineteenth century. In Northampton Mercury cutting of 22 July 1826 he is described as a ‘Teacher of Pianoforte, Violin, Tenor, Violincello, Guitar, Spanish and Harp Guitar, Lyre Lute etc at College Street, Northampton. Their daughter Frances Maria Sternberg taught Italian and English Singing and the Pianoforte (Cutting in Northampton Mercury for 9 September 1826). Described as a pupil of Ferrari, Knyvett & Beale (cutting from Northampton Mercury for 20 January 1827). On 29 Sept 1826 a cutting announced that he had moved to a house adjoining the Stag’s Head Inn in Abington Street. Much of the information contained above was researched by Stan and Gillian Bruce. Gillian is a descendant of William Mumford Sternberg my great grandmother Alice Plucknett Sternberg’ s brother. Stan has added a chapter to ‘Faces of History’ on the ‘German’ Sternbergs and associated families. It is Vincent Thomas Sternberg who was the author of The Dialect and Folk-lore of Northamptonshire in 1851, a second edition appeared in 1852. I have just written a article about him that you are welcome to have a copy of if you so wish. Thank you for the information Stephen. I had wondered if it might be VTS. I would love to have a copy of your article. Is there a Sternbergs in your family who married a Mary Ellen Denby? Not that I am aware of Melanie, sorry.